So a little while ago I got an offer for an Oral Care Sample pack from Sunstar GUM to celebrate National Fresh Breath Week in South Africa (2 to 9 February < that's next week, folks) and it arrived this week. I'd never heard of them before ... and honestly, ordinarily I wouldn't have looked twice. But one of the pregnancy side-effects I am having is that I have noticed some blood when I brush my teeth. Aside from a pink tint when I spit out the toothpaste tho, there is nothing else wrong with my teeth. At the ripe old age of almost 35, I still have yet to have a single filling. So generally I feel like I have teeth in very good condition although I know I don't take care of them as well as I should ... complacency, no doubt. So when this offer came up I jumped at the chance and was completely blown away by what I received! There were things in there I'd never heard of or used before! The things that got me most excited, which I used last night, were the Sunstar GUM Red-Cote Disclosing Tablets (R39.95). You chew on them for 30 seconds and then rinse your mouth and it stains all the plaque on your teeth in red! The other thing I've immediately added to our basin shelf is the packet of Easy Flossers (R39.95 for 30). I hate flossing my teeth but these are perfect. Next I'll give the Flosbrush Automatic (R84.95) and the Tongue Cleaner (R39.95) a try tho! There are so many other little things to try ... some of which I'm not even entirely sure when or what to use them for (things like Soft-Picks?). But big thanks to Sunstar GUM for the opportunity to try them all and learn something new about oral care! The other awesome thing they're doing is running a Kiss-O-Meter Challenge from 01 February. 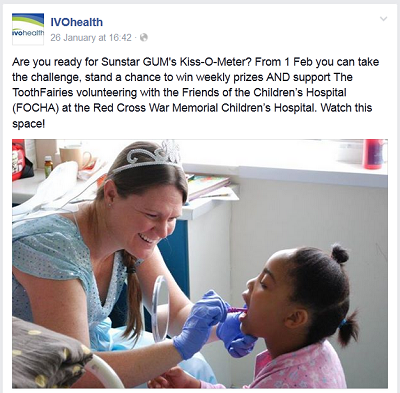 You have to answer an oral care quiz and (here's the important part) for every person who takes the challenge, Sunstar GUM will donate a toothbrush to The Toothfairies working at the Red Cross War Memorial Children's Hospital. I didn't even know this initiative existed, but I think it's an awesome one to support! * You can purchase Sunstar GUM products from dentists, Dischem, selected Pick 'n Pay, Clicks and other pharmacies. 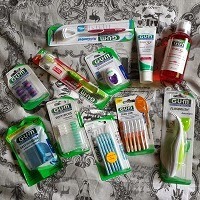 You can also enter to win a fresh breath tool-kit from Sunstar GUM worth over R500 on Health 24. We had those chew things in purple when I was a kid. I hated them! It does give you a shock to see it though, so probably good as an occasional thing.